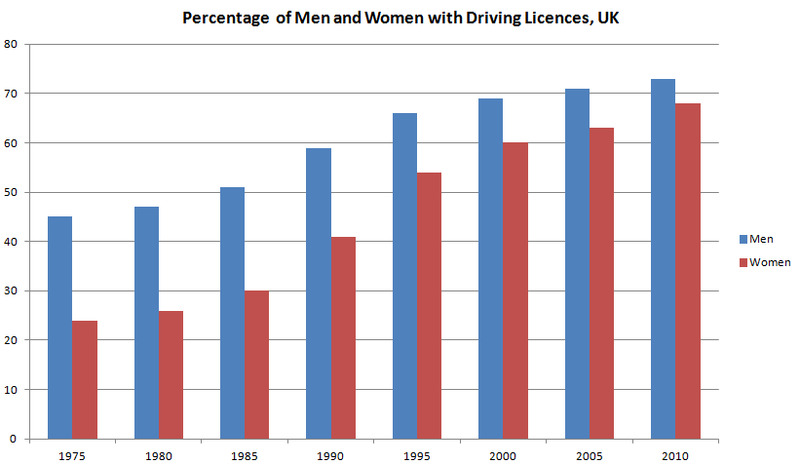 The graphs give information on the percentage of driving license owners in the UK. Write 150 words on the graphs. 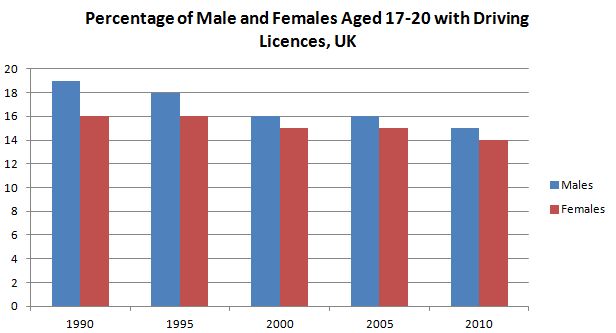 The graphs show the number of UK adults and younger drivers with licenses in the UK between 1975 and 2010. Overall, there has been a huge increase in the number of adults with licenses, particularly for women. 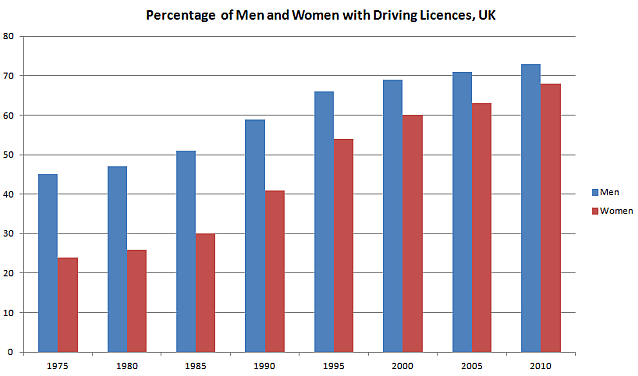 In 1975, less than half of UK males had licenses. The figure stood at 45%. However, only 25% of women had licenses. Over the next ten years, the number increased steadily for men. It rose to 50% in 1985 and almost 70% in 2005, when it started to level off. However the increase for women was much more dramatic. It jumped from 40% in 1990 to almost 55% in 1995 and then continued to rise. By 2010 the number was almost equivalent to the figure for males, at almost 70%. In contrast, the figures for young drivers fell steadily. In 1990, about 19% of teenage boys had a license, but this fell sharply to 15% in 2010. The figure for teenage girls fell slightly, from 16% to 14% over the same period. In conclusion, although more male and female adults have licenses, the number of younger drivers is falling. Protecting the Environment Many people say there is a need to protect the environment, but do not really make any effort to do anything about it. Are you one of these people? What can we do to encourage people to take action to protect the environment?